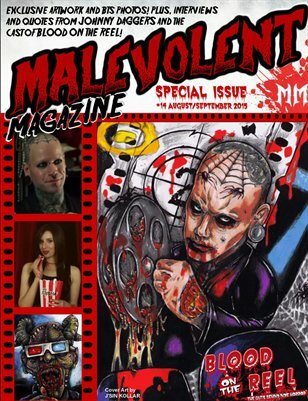 Malevolent Magazine #14 Special Issue - Johnny Daggers' Blood On The Reel with cover art by J'Sin Kollar. Interviews: Johnny Daggers, Bianca Allaine, Kelly Hughes & Vito Trabucco. Quotes from BOTR Cast members. Long Gone Dolls by Teri Campbell Long (Johnny Daggers Doll), Sick Wix by jFEAR (BOTR Candles). FANtastic Horror Film Festival Update by JoAnn Thomas. "A Day In The Life Of A Scream Queen" by Genoveva Rossi. "Top 5 From The Bunker" by Jay K and much more!! !